Near Field Communication « Global Market Insights, Inc. The growing adoption of electronic payments and integrated ticketing system across the globe will stimulate automated fare collection (AFC) system market trends. According to Global Market Insights, Inc., “Global Automated Fare Collection (AFC) System market worth USD 4.51 billion in 2015, will exhibit an annual growth rate of 10.4% over the period of 2016 to 2023.” Transportation infrastructure will drive AFC system industry extensively, as it is used for maintaining customers log, estimating best fare calculation and to check relevant discounts. The implementation of AFC system across the various sectors such as transportation will offer benefits like improved revenue management and fraud prevention. Automated fare collection system industry comprises technologies such as optical character recognition (OCR), magnetic strip, near field communication (NFC), and smart cards. OCR technology is extensively used to generate receipts and tickets. The near field communication technology is projected to record a CAGR of 12.3% over the coming six years, owing to the high demand for this technology owing to its high degree of compatibility. In addition, NFC is a user-friendly technology, which will add benefit over other alternatives such as QR codes and BLE (Bluetooth low-energy). 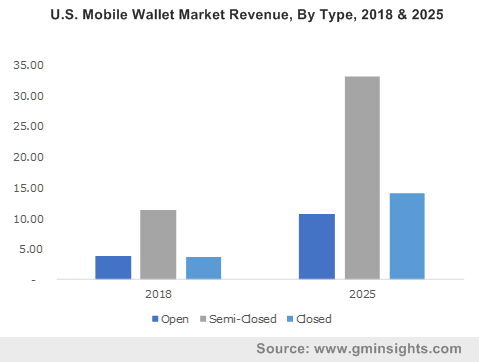 Smart card accounted for 30% of the worldwide automated fare collection system market revenue in 2015 and will display eye-catching growth opportunities over the coming timeline. 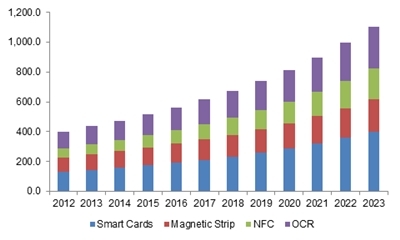 The smart cards offer favorable features such as portability, low complexity, and reliability, which influence the industry trends considerably. Based on the component, AFC industry is mainly segmented into hardware and software. The hardware segment worth more than USD 2.2 billion in 2015, is expected to witness a CAGR of 10.4% over the period of 2016 to 2023. To reduce the complexity as well as to improve the efficiency of the AFC system, software-based technical support has deployed by the software developers and firms which will provide software development kits, database management systems, middleware, mobile platforms, server solutions. Many of the transportation agencies are increasingly looking for software based AFC system, which will stimulate software automated fare collection system industry size lucratively. The market players will invest heavily in the R&D activities to meet customer needs as well as to improve product range over the coming years. The collaboration and joint venture are some of the key strategies adopted by the industry participants to gain enhanced business share. Cubic Systems, Thales Group, Samsung, LG, Omron Corporation, Advance Card Systems, NXP Semiconductors, and Atos are some of the leading companies in the AFC market. This entry was posted in Sustainable & Smart Technologies and tagged AFC Market, AFC Market Size, Automated Fare Collection, Automated Fare Collection System, Automated Fare Collection System Market, Automated Fare Collection System Market Analysis, Automated Fare Collection System Market Forecast, Automated Fare Collection System Market Share, Automated Fare Collection System Market Size, Automated Fare Collection System Market Trends, Magnetic Strip, Near Field Communication, NFC, OCR, Optical Character Recognition, Public Transport, Smart Cards.